Drafting tables are large and heavy and difficult to move. Sometimes the draftsman needs to work in various places and on a temporary basis. It is very difficult to carry a drafting table to a field or remote location. You can build a portable drafting table top that is easily moved and set up. You can build such a table top even if you have little or no experience in less than six hours. A regular drafting table is too large and heavy to be protable. Cut a 4 by 8 foot piece of cabinet-grade plywood with a circular saw. 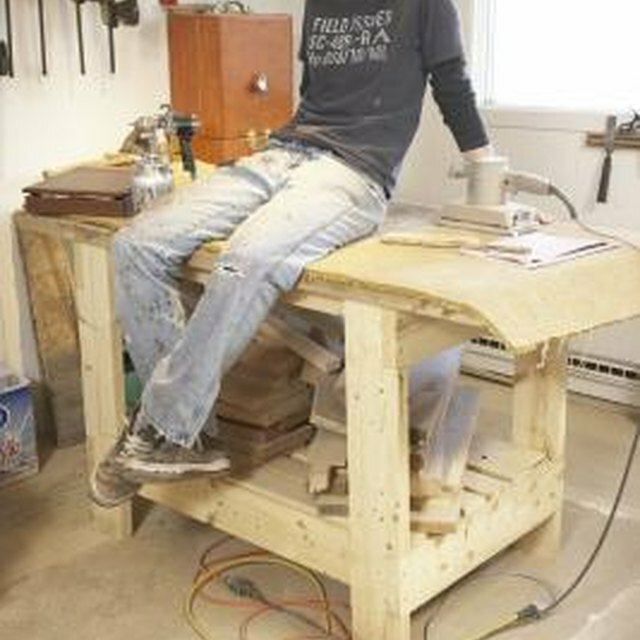 Place the plywood on two sawhorses horizontally. Measure up from the bottom 32 inches on each end and place a mark. Snap a chalk line along the plywood to connect the two marks. Blow the excess chalk off of the plywood and place blue masking tape along the chalk line. This will prevent splintering of the plywood. Snap the chalk line once again on the premarked measurements, placing the line on top of the masking tape. Cut the plywood along the chalk line with a circular saw fitted with a blade for plywood. Put on a dust mask and safety goggles prior to cutting. Keep the two plywood pieces aligned after the cut. Do not flip or turn either piece. Place heavy duty hinges along the plywood, connecting the two cut pieces. Place four hinges along the plywood, spacing them 24 inches apart. Inset the two end hinges by 4 inches. The table will now collapse and fold into a smaller, manageable section. The side with the hinges is now the bottom of the drafting table. Attach two 2-by-4 boards the length of the table at the top (16-inch section) with 3-inch wood screws. This lumber will serve to lift the table slightly. Align the first 2-by-4 with the top edge of the table. Offset the second 2-by-4 by allowing it to hang over the previous piece by 2 inches, toward the bottom of the table. Cut two 2-by-4 boards to extend from the bottom of the table, across the hinged section and into the slotted 2-by-4 boards on the top. The 2-by-4 at the top that is overhung will serve as a slot for the side 2-by-4 boards to slide into. These two 2-by-4 boards will hold the table straight, keeping the hinges from collapsing. Remove them when collapsing the table. Flip the table over to the top side. Attach a 2-by-4 along the bottom, aligning it with the bottom edge. Use 1 1/2-inch wood screws to secure the lumber. This 2-by-4 will serve to hold paper, pencils and rulers on the table. Fold the table when transporting and use it in various locations where a permanent table is not practical.